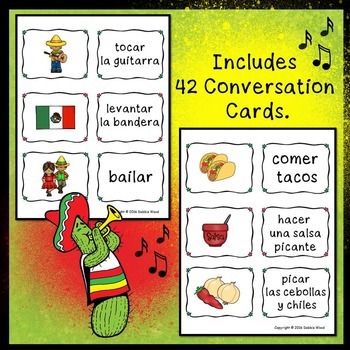 Celebrate Cinco de Mayo this year in your Spanish language classroom with these conversation cards. Students will have fun as they mingle around the classroom engaging with each other in the target language. 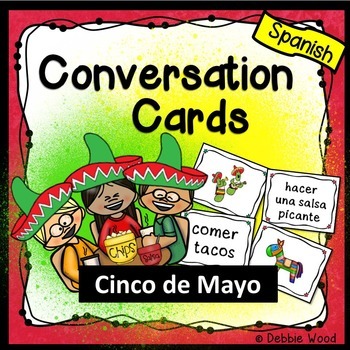 This set includes 42 conversation cards which focus on Cinco de Mayo. 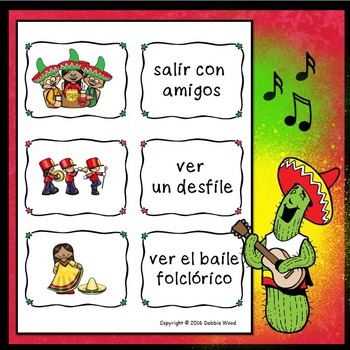 These cards include vocabulary phrases such as “escuchar mariachi”, “llevar un sombrero”, “hacer una salsa picante”, “comer tacos”, “quebrar una piñata” etc. You can laminate and cut up these conversation cards to use them in a variety of different ways in your classroom. 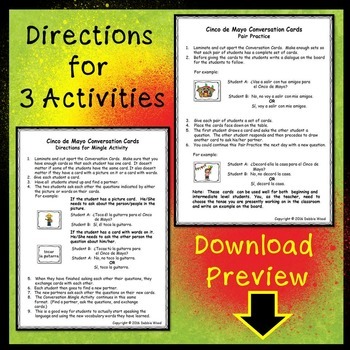 Also included are the directions to implement three different fun, interactive activities in your own classroom. Your students will love these conversation cards! This set is good for first and second year Spanish classes.